Article 18 of the UN Charter, and rules 82-95 of the Rules of Procedure, concern voting in the General Assembly. 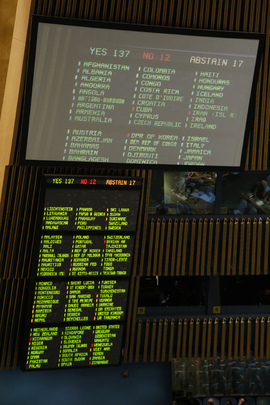 An analysis of General Assembly voting can be found in the Repertory of Practice of UN Organs by consulting the section relating to Article 18. The majority of General Assembly resolutions are adopted without a vote. There are multiple sources for General Assembly voting information. Voting information first becomes accessible, in unofficial form, in the press release produced immediately after the conclusion of the meeting. Official voting information can be retrieved from the meeting record at which the vote was taken. Beginning with the 54th session in 1999, official voting information can also be found in the sessional cumulations of the resolutions of the General Assembly. The UN Library in New York maintains a database with voting records which forms the basis for the voting chart included in the Index to Proceedings of the General Assembly as well as the voting information file contained in UNBISnet. 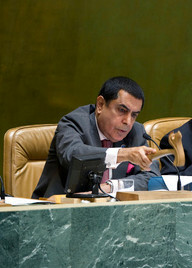 Voting is also conducted in the Main Committees of the General Assembly. Although preliminary in character, this information might be of interest to researchers following each stage of the voting process. Committee voting information can be found in the meeting records of the Committees as well as in the reports which the Committees submit to the plenary on each agenda item allocated to them. The official record of a vote is found in the meeting record of the General Assembly. The President: I shall now put to the vote draft resolution A/52/L.13 as a whole. In favour: Algeria, Andorra, Angola, Argentina, Armenia, Australia, Austria, Azerbaijan, Bahamas, Bahrain, Bangladesh, Belarus, Belgium, Benin, Bhutan, Bolivia, Botswana, Brazil, Brunei Darussalam, Bulgaria, Burkina Faso, Burundi (...). Draft resolution A/52/L.13 as a whole was adopted by 151 votes to 1, with 5 abstentions (resolution 52/11). The President: I shall now call on those representatives who wish to speak in explanation of vote. I should like to remind representatives that explanations of vote are limited to 10 minutes and should be made by delegations from their seats. The UN Library in New York maintains a voting database in UNBISnet. The information provided comes from the voting machine in the General Assembly Hall. If a Member State informs the Secretariat of an error in the vote, the data is not changed and the vote must therefore be researched in the meeting records. Refers to countries which, according to Charter Article 19, cannot vote because the amount of their arrears equals or exceeds the amount of contributions due from them for the preceding two full years. The database does not include information about votes on draft resolutions not adopted. Since 1975 a voting chart published in the Index to Proceedings of the General Assembly, provides an overview of the votes taken at a particular session. When using the chart, researchers must be aware that the method of compiling this information was changed in 1983. Between 1975 (30th session) and 1982 (37th session), the voting information was extracted from the meeting records and thus includes notifications submitted at a later point. A blank space indicates that no vote was recorded. From 1982 (37th session) onwards, data transmitted by the voting machine in the General Assembly Hall forms the basis for the chart. As a consequence, it no longer includes the notifications subsequently submitted. To obtain this information, researchers need to consult the meeting records.